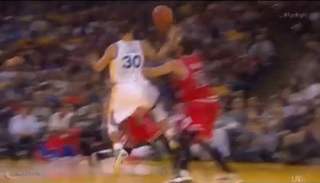 What The Hell Did Stephen Curry Just Do With This Pass? The headline isn't an attempt at hyperbole but a legitimate question. I've watched this on replay four or five times now and I still can't figure out how Steph Curry smoothly pulled this off. I'm sitting on my couch trying to swing an imaginary ball from my left hand to my right and then over my shoulder to the dog passed out next to me. At least I'm not the only one.